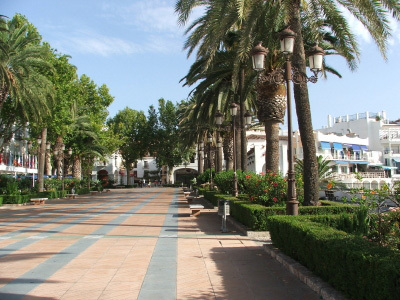 Nerja is the Costa del Sol's most easterly resort, 50 km from Malaga airport. Originally a sleepy fishing village it is now a thriving all year round holiday and residential resort but Nerja has managed to retain much of its original character and charm. It is still at heart a Spanish village and the old part of the town has narrow, winding streets with whitewashed houses. In amongst these streets you can find shops selling local art and craftwork, typical jewellery and local products and a huge selection of bars and restaurants that range from cheap and cheerful tapas bars to fine dining restaurants for that special occasion. One of the many reasons foreigners choose Nerja as a holiday destination or a place to live is the many fiestas and festivals that Nerja celebrates throughout the year, from the 3 Kings celebration parade on 5th January, Nerja Carnival in March/April to the biggest beach party in Spain on 23rd of July to Celebrate San Juan and of course Nerja Feria the second week in October there is pretty much a fiesta every month of the year. 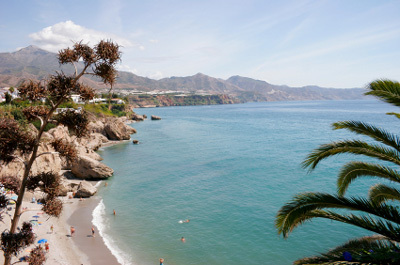 June is really the start of summer here and Nerja and the only the only chance to camp on the beach is on June 23rd. The festival of San Juan is 24th June but the night before there will be lots and lots of people on the beach with barbecues and tents. Held to celebrate the longest day (24th is when the nights start to get shorter) and bonfires are lit to try and persuade the sun not to set early. At midnight people run into the sea, or at least wet their heads three times and then jump over a fire. All part of Pagan origins but a geat excuse for a party! 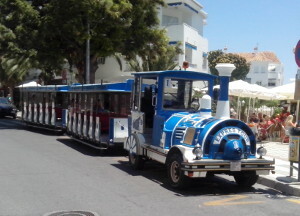 A new mini-train for tourists will connect Nerja caves with the town's historic centre. The scenic route will also feature a stop at the small fishing village of Maro with the aim of boosting trade there, as well as at Verano Azul park. The announcement was made after an agreement between the president of Nerja caves, Jorge Hernandez Molar, and Nerja mayor Jose Alberto Armijo. An audio guide offering information about the various places and monuments passed on the journey will be included. Built on the site of a 9th Century Moorish fortress the Balcon de Europa, in the heart of Nerja, is a beautiful viewing point overlooking the sea with spectacular views of cliffs all along the coastline and of the pretty coves and small beaches below. Local legend would have us believe that is was so named by King Alfonso XII who when visiting in 1885 following a disastrous earthquake stood at the end of the Balcon and reputedly said "This is the balcony of Europe". There is a life size statue of the king standing by the railing.From here you can also see the spectacular mountains of the Sierra de Almijara. The avenue leading to it is lined with palm trees and benches and provides a shady respite from the hot sun and you will often see locals sitting around and chatting. 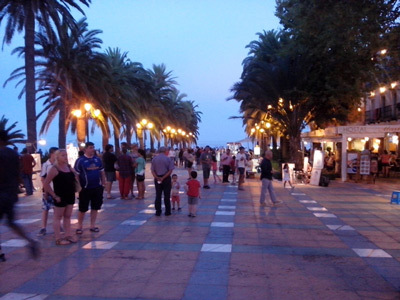 This is the heart of Nerja and on an evening people love to promenade and look at the views from the Balcon and wander past the the 17th Century El Salvador Church. Only 3 km from the town you will find the main tourist attraction of the area, the Caves of Nerja. They contain many impressive stalactites and stalagmites and an enormous cavern which is used for concerts during the summer months. There are also a number of 20,000 year old paintings which unfortunately are in the restricted area. Given that many visitors come to the Costa del Sol for the beaches Nerja is a perfect choice with 1.5 km of sandy beaches the best of which is thought to be Burrianna beach at the far east of the town which has been awarded the Blue flag of the European Union on various occasions but there are many small, beautiful beaches for those looking for something more quaint, such as Calahonda beach to the left of the Balcon. As in most of the resorts on the Costa del Sol there is a full range of water sports available in Nerja including water skiing, scuba diving and canoeing. The countryside around Nerja offers those not wanting to spend all their time on the beach a range of other activities. You can go walking in the Axarquia where there are plenty of trails for walkers of varying levels. You can get information and maps from the tourist office in Nerja which can be found just of the Balcon de Europa or if you would prefer to go on some organised, guided walks from Nerja. You can also go cycling or mountain biking, horse riding, paragliding or take a jeep safari. There are two options for anyone wishing to camp, the campsite on the outskirts of the town or a less organised camping area in the park above the caves. For those looking for nightlife you should go to Tuti Fruti Square where the disco pubs are located. Many are run by English speaking people so it should be no problem to order what you want. Nerja has much to offer for food lovers such as a wide range of fish restaurants all the way along Burriana beach where you can sample local specialities such as pescaito frito (Fried fish) and paella, many traditional tapas bars situated in the old part of the town which give a free tapa with every drink and a large number of international restaurants eg, Greek, Mexican and Indian with prices and menus to suit everyone. Many of the traditional festivals are still celebrated in Nerja some of which include the town feria between 8th October and 12th October, Holy week and the festival of San Isidro celebrated on May 15th with a parade starting at the Balcon de Europa and ending at the caves with a big country style party. Situated between the Sierra de Almijara mountains and the sparkling waters of the Mediterranean Nerja enjoys one of the best climates in Europe with around 320 days of sunshine each year. The summer temperatures tend to be around 30ºC whilst in winter they are around 20ºC and this allows for sunbathing for about 9 months of the year. These mild winter temperatures allow residents and visitors alike to enjoy an outdoor life all year round. For more details see our Nerja Weather page.